Shenanigans is a well cared for 1977 Grand Banks 42 Classic. 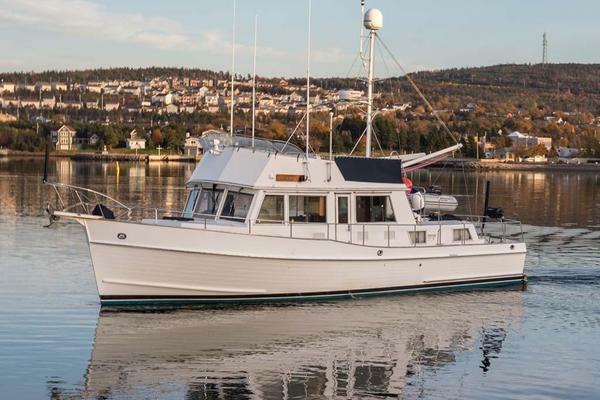 The GB42 is the base by which all other trawlers and downeast cruisers are measured against. These popular yachts boast high quality construction, layout, and comfort. There's a reason why these yachts were built for over 30 years with more than 1,500 hulls built. Shenanigans is no exception. Her owners have kept her in good shape cosmetically and mechanically. She has newer canvas, newer electronics, newer fuel tanks, and a newer genset. Her exterior teak trim was just varnished and she is getting a full spring detail. If you're in the market for a GB42 to do the Loop, cruise to the islands, or just explore the Chesapeake, then make sure to come see Shenanigans before she's gone! Shenanigans is equipped with a forward V-berth, and aft cabin with port single and starboard double berths. The port aft berth can be converted to a double, this is a custom addition. Both heads are equipped with newer electro scan Lectra/San MSD devices. The salon is nicely apportioned with a L-shaped settee, varnished gloss table with cover, flatscreen TV, and bar area. Plow and Danforth Anchors, Separate Chain and Rode for each.